Revalidation for UK nurses requires engagement in reflective practice as part of continuing professional development. 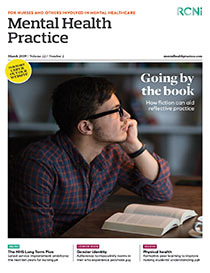 In this article, the authors look at the usefulness of fiction as an aid to reflective practice and how nurses can integrate fiction, reading and writing into the reflective process. They argue that using fiction can help lead to desired outcomes for mental health nurses. Nurses can use the elements of reading and writing fiction formally or in a less formal way of exploring, interpreting and relaxing. Specifically, we will look at how fiction can help us make sense of ourselves and our clients and increase our empathy so that we can understand our practice and our role more clearly.